Catalogues raisonnés play a critically important role in researching prints and printmakers and, often, in establishing authenticity and/or defining the state of a print. The PCA Index to Oeuvre-Catalogues is the best single resource for finding the important catalogues raisonnés for any given printmaker. Scroll down to find further sources and suggestions for finding catalogues raisonnés. Print Council of America. The Print Council Index to Oeuvre-Catalogues of Prints by European and American Artists. Online version of The Print Council Index to Oeuvre-Catalogues of Prints by European and American Artists by Timothy A. Riggs (Clark Reference ZNE485 R58), expanded and brought up-to-date by Lauren B. Hewes and Nicole Simpson. Bibliography of oeuvre-catalogs, defined as any print listing of an artist's total output, or some clearly defined section of that output. The database now contains entries for European and American prints, print publishers, drawings, and photographs; and Japanese prints and photographs. Publications on a given artist or publisher are displayed chronologically by publication date, from earliest to most recent. Searchable by artist's last name or publisher whose work is being cataloged; click "Notes" for instructions on searching artists known by dates, nicknames, or monograms. The works listed in the Print Council Index are comprehensive but not all artists are included in them; contemporary artists, in particular, may not have a formal published catalogue raisonné. Use WorldCat and/or highly respected art library catalogs (such as the Met, the Getty, the National Gallery, or Art Discovery Group Catalogue, a WorldCat search of the holdings of several dozen international art libraries) to search for catalogues raisonnés. In many cases, works may be cataloged with the subject heading catalogues raisonnés, and any search of WorldCat or a library catalog could start there. In the case of contemporary artists try looking for exhibition catalogs, which often make heroic attempts to list an artist's works and exhibition history as well as a bibliography of reviews, articles, and other publications. In addition, contemporary artists often create their own websites, which include galleries of the artist's work that (if complete) can function as online catalogues raisonnés. Max Klinger, Intermezzi, Opus IV, Bl. 8 : Simplicius am Grab des Einsiedlers (Simplicius at the Hermit's Grave). 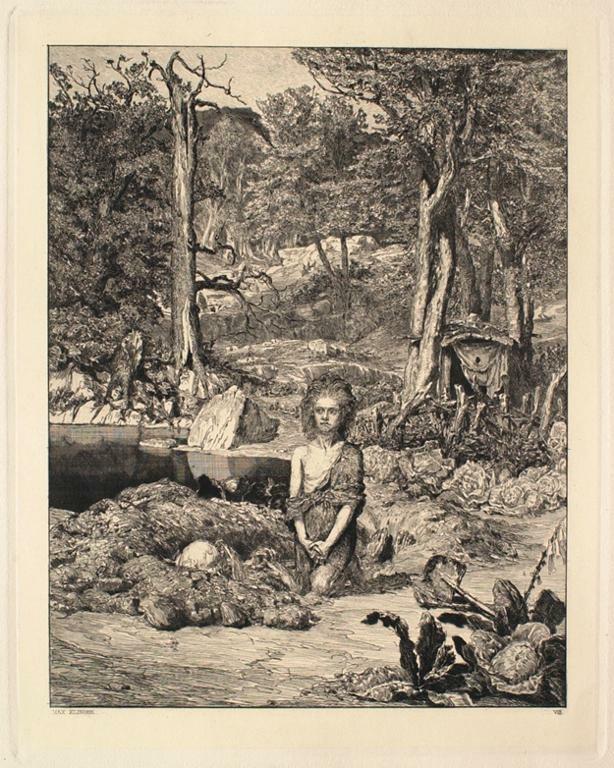 Etching and aquatint on paper, 1881. Sterling and Francine Clark Art Institute, Williamstown, Mass.